A fascinating species that evolved from plants that covered the earth millions of years ago. The hollow, segmented stems are very high in silica. 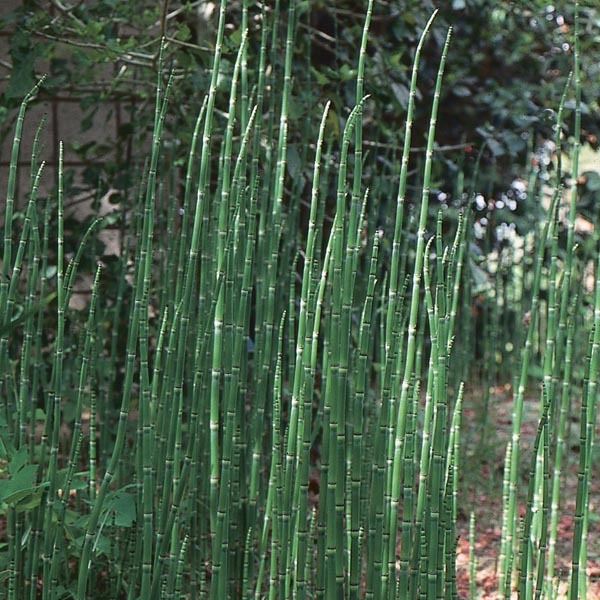 The common name "Scouring Rush" comes from its use as a polish for shining metals. 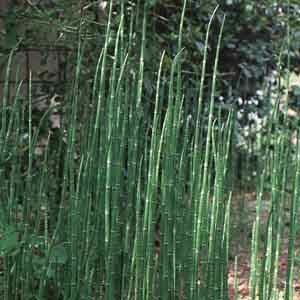 Horsetail adds a truly unique form and texture to the garden and is an attractive, carefree solution for areas with soggy soil. Especially nice in waterside gardens. Perfect for use in swampy areas and areas around ponds, lakes and streams. Good in containers placed into shallow water. Grow in fertile, humus-rich soil. Place in areas that stay wet all year, or in water 1-3" (3-8cm) over soil. Amend the soil annually with organic matter. May become invasive if left unchecked.